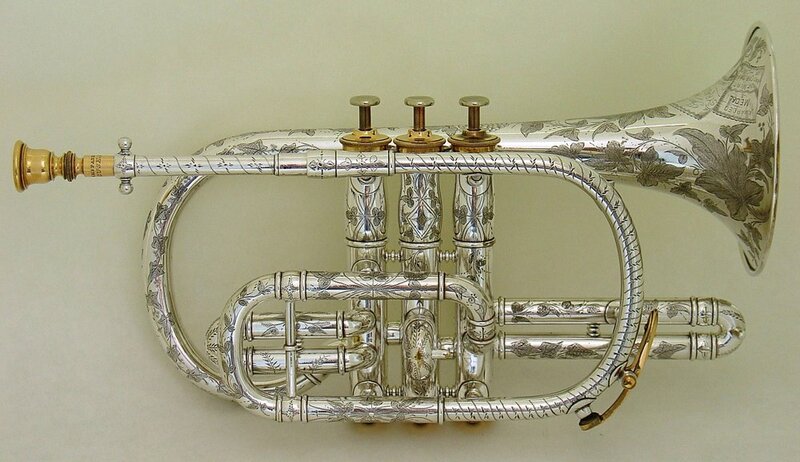 Along with my list of used brass instruments for sale, this website is intended to show my work and interests that I have spent the last 40 years developing. I have a passion for learning and sharing the history of the brass instrument industry and the instruments that they produced. I try to present this in the many pages linked through the gallery below. Feb. 5: Fiske Circular Cornet with Five Valves. and read the history and technical details. On various brass topics, including trumpet and cornet origins. This section covers all topics relating to the mechanics of brass instruments including repairs. Unusual instruments, both newly made and modifications of existing instruments. Pages with histories of brass instrument makers, listed alphabetically, with photos of their products. I update my list of used and antique instruments for sale on a weekly basis or as my schedule allows.